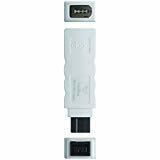 Easily connect your Thunderbolt-equipped Mac to a FireWire device with the Apple Thunderbolt to FireWire Adapter. 1. Use the Digital AV Adapter with your lphone, pad, or pod with connector. 2. The Digital AV Adapter supports mirroring of what is displayed on your device screen including apps, presentations, websites, slideshows, and more to your HDMI enabled TV, display, projector, or other compatible display in up to 1080P HD. 3. It also outputs video content movies, TV shows, captured video to your big screen in up to 1080P HD. Simply attach the Digital AV Adapter to the connector on your device and then to your TV or projector via an HDMI cable. 4. Its compact and lightweight design allows you to carry in your bag and connect your lphone, pad or pod anywhere. This is perfect for home entertainment, training, business meetings and much more. For lphone 5,5c,5s,SE,6,6 Plus,6S,6S 7 Plus. For pad with Retina Display,pad mini,mini 2,mini 3,mini 4,Air, Air 2,pad Pro(9.7-Inch) and pad Pro(12.9-Inch). 1. Insert the lighting cable into the 5V/2A USB AC Adapter. 2. HDMI Port: connect to your TV or big screen via HDMI cable. 3. Lighting connection: connect into your lphone, pad, pod. 4. Please click the "Trust" and wait 5 seconds to synchronize the phone screen with the TV. Due to HDCP copyright protection measures, the lighting to HDMI adapter doesn't work with some paid contents including Netflix, Amazon video, DIRECTV, HULU and other App which need to be paid fee. High Quality to 1080P HD The Digital AV Adapter supports mirroring of what is displayed on your device screen - including apps, presentations, websites, slide-shows and more to your TV with HDMI, display, projector or other compatible display in up to 1080p HD. Apps Supported: YouTube, Office, Safari, Chrome, Face-time etc. 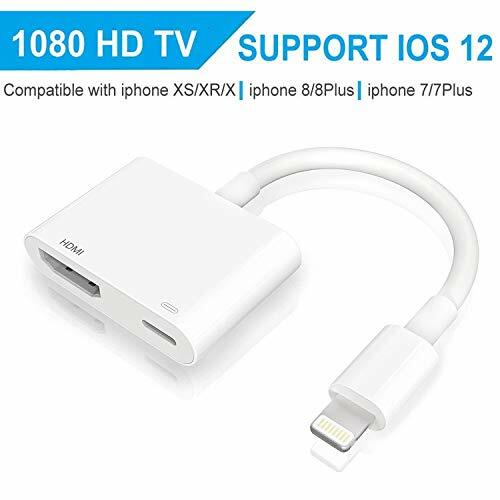 great Compatibility The HDMI Adapter Compatible with phone X, 8,8 Plus, 7,7 Plus,6,6 Plus,6S,6S Plus,5,5c,5s,SE; pad with Retina Display, pad mini,mini 2,mini 3,mini 4,Air, Air 2,pad Pro(9.7-Inch) and pad Pro(12.9-Inch); pod Touch 5th Gen(32gb and 64GB), pod Touch 5th Gen 16gb, pod touch 6th Generation. Easy To Carry and use With light and small design, it is very convenient to carry and connect your phone, pad at anytime to a devices with HDMI for home entertainment (watching movies, sharing pictures and more), business meetings, education, training and etc. Not Compatible with HDCP Not Compatible with Apps which have HDCP video copyrights protection. like Netflix, Amazon video, DIRECTV, HULU other Apps which need to be paid fee. We warrant this item 12 MONTHS and 30 Days of easy returns from date of the original purchase for manufacturer defects, please feel free to contact us if you have any questions. "Include: FireWire 400 to 800 Adapter 1pcs , elago FireWire 400 to 800 FireWire adapter provides a simple way to connect FireWire 400 devices to the latest Mac Pro, MacBook Pro, Mac Mini, iMac and all other computers with a FireWire 800 port. Just plug it in between a FireWire 800 port and a standard FireWire 400 cable's 6-pin male connector (the other end of the FW400 cable plugs into your FireWire device). 1080P High Definition --- The Digital HDMI Adapter supports mirroring of what is displayed on your device screen, including images,movies,games and more to your HDMI equipped TV, display, projector or other compatible display in resolutions up to Full High Definition (1080p), Providing ultra-clear visual feast in daily life and work. Plug and Play User Friendly --- Easy to get a fast and stable connection, automatic mirroring. No need any APP & Personal Hot spot or WIFI, No need to adjust the Mirror of phone/pad ( Please Note: 5V 1A USB Charging cable MUST be plugged before use ). Ultra Thin and Lightweight --- It has a compact and light weight design, which allows you to carry it in your bag everywhere. You can connect your phone, pad or pod anywhere. Watch your media or deliver your presentation on a bigger screen everywhere. it is so convenient. And the high quality PVC material make the bend lifespan up to 30000+(Base on internal testing). This is perfect for home entertainment, training, business meetings and much more. Great Compatibility --- Fully compatible with all AppIe products. phone X, phone 8/ 8 Plus, phone 7/7 Plus, phone 6/6S, phone 6 Plus/ 6S Plus, phone 5/5S/5C/SE; pad Air, pad Pro, pad mini series; pad Pro, pod Touch 5th/ pod Touch 6th. Confident Purchase --- We warrant this item 12 MONTHS and 30 Days of easy returns from date of the original purchase for manufacturer defects. Please feel free to contact us if you have any questions. Note: NetFlex / BTSports / Netflix / HBO GO / Xfinity Player / Amazon video / Hulu / Directv and other paid videos in App may NOT supported. 6.Just plug it in between a FireWire 800 port and a standard FireWire 400 cable's 6-pin male connector (the other end of the FW400 cable plugs into your FireWire device). Easily transfer data from one Firewire device to another with this converter. Work with standard 6-pin Female FW400 cables and 9-pin Male FW800 cables. Connect your old Firewire 400 ports to the new standard of Firewire 800 with this coupler. Transfer data from old Firewire units such as digital camcorders, external hard drives, Mac computers, and many more with a fast data transfer rate!! With the iphone to HDMI Adapter Converter, you can enjoy the super big screen from your phones and share the happiness with your family or friend together on your HDTV. 1 The Phone to HDMI adapter cable can support YouTube/ Office/ Safari/ Chrome/ FaceTime, While NOT support NETFLIX / amazon Video/ DIRECTV/ hulu. 3 Please Note: The pad to HDMI adapter will get a little hot when using but it's NORMAL and SAFE. 4 The Phone to TV HDMI cable can support the pictures in the format below: BMP and JPEG. 1.Plug the HDMI connector to the TV/Projector HDMI port. 2.Use an extra changing cable to supply power (Strongly recommended Phone USB cable and adapter5V/2A). 1.The HDMI adapter must be connected to power source to function. if not , the item will not work. Attention : The Phone to HDMI adapter won't support certain paid Apps, such as Netflix, Amazon Prime videos, BT Sport,Movie Box,Hulu, Comcast tv, Xfinity,Slingplayer,Flixster, HBO, Netball live,Vudu, DIRECT HBO go, Discovery Go and Honda motor sky q sky go,sky sports,AV Player,Facebook live,NBA,ABC PLAYER Honda Link and any other paid Apps. Power Supply Needed : Please make sure the female port connect to the charging power supply, if not, the adapter will not work! (Strongly recommended Phone original USB cable and adapter 5V/2A). Plug & Play : No need install any driver/App/Personal Hotspot/Airplay, just use an extra cable to power adapter to charge, then click the Trust button when connecting and then wait it to connect automatically, and no need any setting on your mobile devices side. 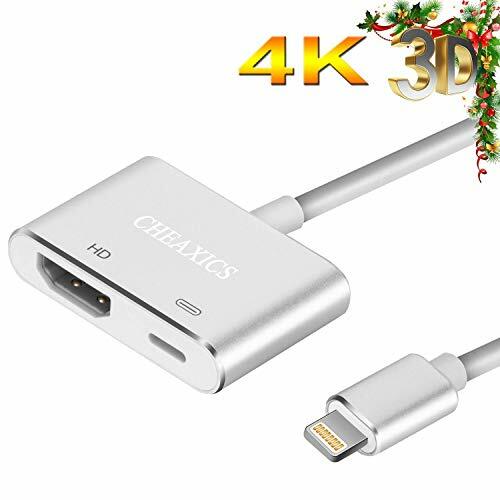 Compatible Device : This Digital AV Adapter compatible with iPhone XS/XS Max/XR/X/8/ 8 Plus/7 /7 Plus/ 6s / 6s Plus/6 / 6 Plus,iPad Air/mini/Pro, iPod touch(5th Generation), The HDMI Adapter Converter compatible with YouTube, IDMB, Quickflix, Family On TV, ABC, NBC, FOX, Microsoft Office and more videos downloaded and saved on your iOS. Please Note : 1. If the item not reach to your expectation, we will provide you with a full refund or replacement.Please feel free to contact us if you have any questions. 2. The Digital AV Adapter will get a little hot when using but it's NORMAL and SAFE. 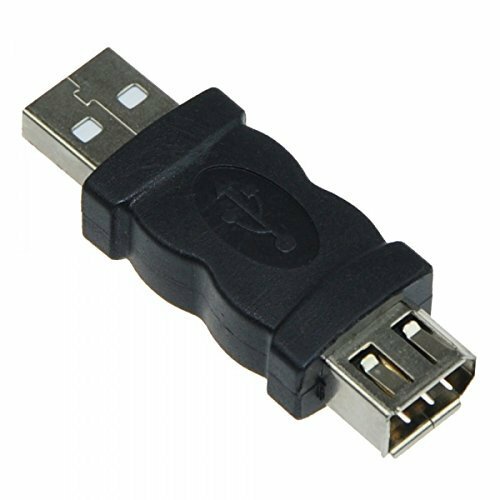 This is a Male USB 2.0 to?Female Firewire 6 pin 1394 adapter. 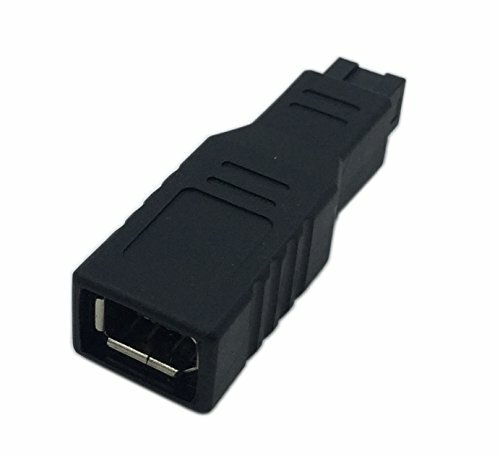 If you don't have a female firewire port on your computer this will solve the issue. Simply plug the peripheral device's firewire cable into this adapter then the adapter into the USB input port on your computer. 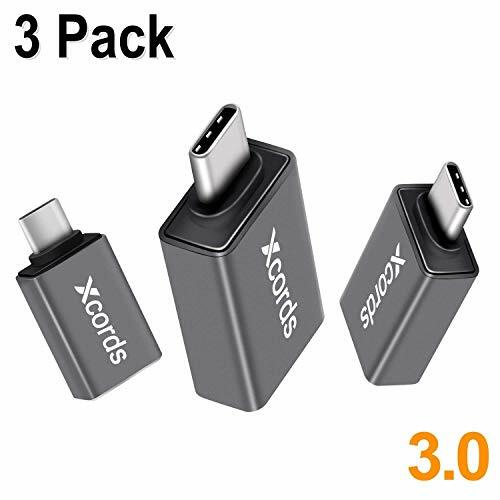 3 packs of tiny, lightweight, durable USB C adapter. Super convenient to take Xcords USB C adapter with you anywhere. 3 amperes fast charging speed, USB 3.0 offers super speed of 5Gbps data transmission. Support various quick-charge agreements (QUALCOMM QC agreement is the mainstream). The electroplating layer minimizes contact resistance and helps faster data transmission speed (up to 5Gbs). The shielding shell minimizes electromagnetic signal to keep stable phone signal and WI-FI connection for your phone when in charging. Internal unibody design enhances the tension technique of the type c connector, more durable to withstand the bending and repeat plug-and-unplug. The aluminum-shell connector, anti-heat and anti-corrosion, ensures its superior functionality under heavy use. And ALL other devices with Type C connector. All Xcords products are backed by our 12 Month Product Warranty. If you have any question about our products, please feel free to contact us, and we will solve your problem within 24 hours. Easy to use & Fashion design - The smaller size and thinner material make it easier to use and carry, also with better dissipation. Minimalist design without any installation required, just simply plug and enjoy your convenient digital life! Charge and connect your favorite device, including watching Audio and video in 4K resolution for a convenient all-in-one adapter. Aluminum design complements Apple MacBook computers and accessories. Multi-functional: ultra-fast data transfer with the included 2x USB a 3.0 ports and a USB Type-C port. Use the hub's 4K HDMI port to output video from your computer to a HD monitor. Usb Type C input: specifically designed for Type-C products. Type-c charge through for the Macbook Pro 2016/2017 (W/ Touch Bar), Chromebook, and other USB-C devices. Easy to use: Just plug and play. It's that simple! No additional installation or software necessary. The included pass-through charging Type C port, you can easily charge your computer without sacrificing your Type-C port. Quality design: Small, compact, and perfect for travel. An aesthetic accessory made of a durable aluminum frame. Backed by trianium's one-year warranty guaranteed to our valued customers. HDMI Adapter Converter, Digital AV Adapter, 1080P Audio AV Connector is perfect for your daily use, which helps mirror your photos and videos to a big screen, brings you the most exciting experience and save your money. 1.Connect the Adapter to outlet via your phone/iPad charge cable and adapter. 2.Plug the Adapter to the TV/Projector HDMI port via a HDMI cable. 4.Connect the Adapter to your phone/iPad, the phones' screen will pop out a "Trust" option, just click it then wait it to connect automatically. (If not, please reboot your Phone/Pad and try again). 1. Please make sure this adapter connect to socket via your Phone/Pad charge cable and adapter while using it. 2. This adapter will NOT Support APPs which have "HDCP" video copyrights protection (Paid Video) like Netflix, Amazon video, HBO go, HULU, SKY Q and Honda motor. 3. This adapter will get a little hot when using but it's NORMAL and SAFE. Must Charging HDMI Adapter : Please Note: The lighting female port are mainly for supply power to this adapter. It also charges your device while displaying without worrying about lacking of power. APPs Limitation : Not Compatible with Apps which have HDCP video copyrights protection like Netflix, Amazon video, DIRECTV, HULU other App which need to be paid fee. We warrant this item 12 MONTHS and 30 Days of easy returns from date of the original purchase for manufacturer defects, please feel free to contact us if you have any questions. 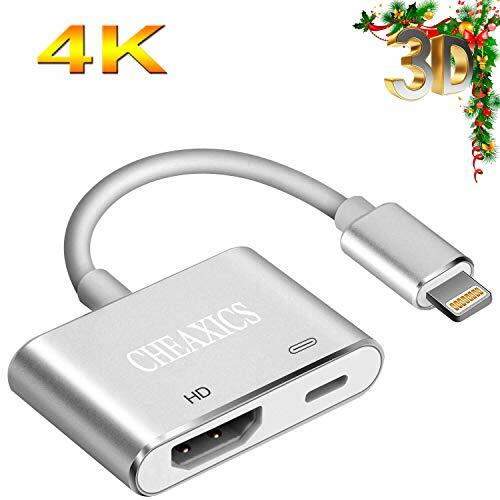 1080P UHD Resolutions : This Adapter mirror what is displayed on your Phone/Pad, including videos, apps, presentations, websites, slide shows to your big screen up to 1080P HD. Plug & Play : No need to install any App, Just use an extra lightning cable to power adapter to charge, then click the Trust button when connecting and then wait 5 seconds to connect automatically, you will enjoy the larger and clearer screen. Easy to Carry : With durable and compact design, it's easy to carry with you whatwhere you go. Newertech Mini DVI to DVI Video Adapter. 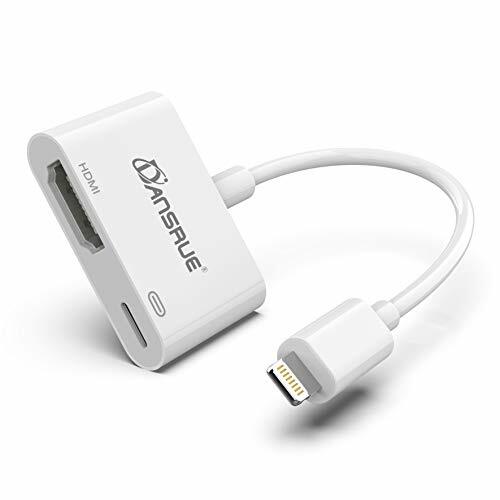 The Mini DVI to DVI Adapter lets you connect an advanced digital monitor, such as the 20- or 23-inch Apple Cinema Display, to a iMac Intel Core Duo & Core 2 Duo (2006-2008), MacBooks (except the 2009 white unibody), Mac mini (Early & Late 2009 models), and 12-inch PowerBook G4. The iMac, MacBook, Mac mini or 12-inch PowerBook G4 that allows you to connect an external display or projector using an adapter. You can use an external display as your main workspace or to extend your desktop, or you can work in mirrored mode with a projector so you can view what your audience sees. 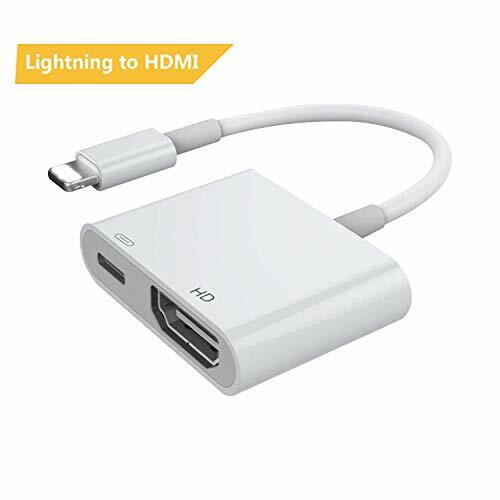 Use the Mini DisplayPort to DVI Adapter to connect to any high resolution display up to 24" that includes a DVI connector. Review the documentation or check with the manufacturer of your monitor to make sure you're choosing the right adapter. 5-in-1 USB Type C Hub for any USB-C devices. 4K@60Hz (3840x2160) Resolution and 3D HDMI video outputs. Durable Aluminum USB C hub with multi-protection, but it would be a little hotter than plastic hub which is normal just like your aluminum alloy laptop/flash drive/smartphone will be hot after a long time use. For 4K video output, it supports Max 60Hz refresh rate instead of the other usb c hub which is only supported 30Hz. A standard HDMI cable is necessary. 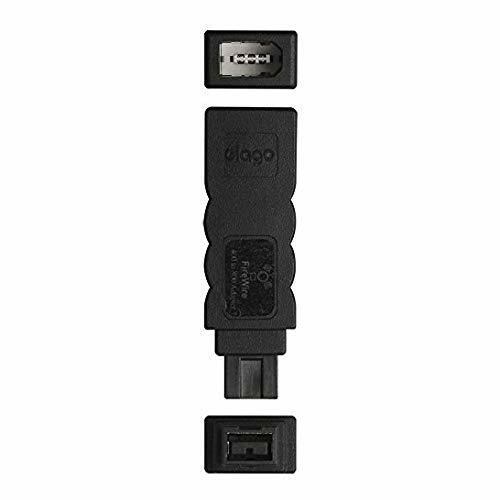 Original Nintendo switch power adapter (15V) is requested when used for switch video games, must connect the PD port before you plug the data cable with your switch console. Charging laptop through this usb c hub will be a little slower than charging directly through the wall charger as this hub will cost about 7.5W for working. 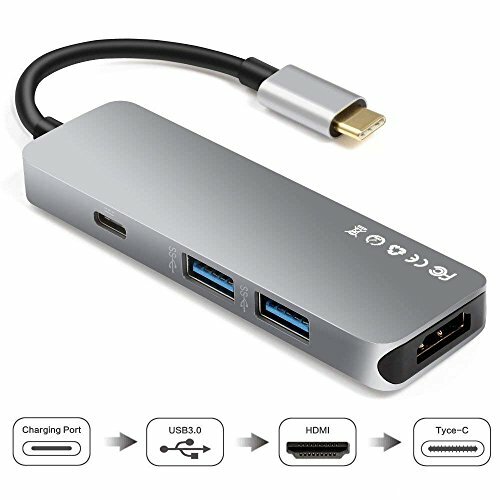 5-in-1 Multi Ports Adapter Expand your USB-C Port-Five ports can work at the same time.Instantly connect multiple peripherals to your MacBook, Samsung Galaxy S8/S9, or any Type-C laptop with WBPINE USB C hub to meet your different demands. 4K @ 60Hz HDMI Video Output Enables you to mirror or extend the display of your New Nintendo Switch Hub/laptop/phone to your TV, monitor or projector in up to 4K UHD (3840x2160@60Hz)resolution. Help you enjoy nice pictures on movies and in work. (Backward support 2K/1080p/720p/480p/360p resolutions). Fast 100W PD Recharging The USB port provides highest data transfer speed up to 5 Gbps and supports up to 100W power delivery. It can easily transfer a HD movies in very short time.Compatible with USB flash disk, camera, removable hard drive, mouse, keyboard or other USB A 2.0/USB A 3.0 devices. Convenient & Portable USB C port works also for charging. There is no more troubles of plugging and unplugging to switch between charging and data transfer,Lightweight thus convenient for office work, travel and business trips. The slim aluminum body provides better heat dissipation. 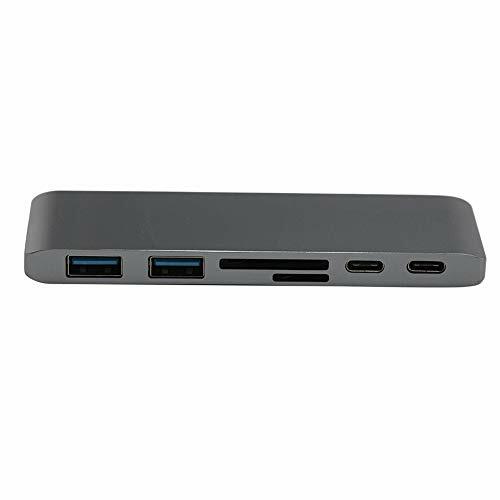 Wide Compatibility WBPINE USB C Hub is compatible with all new Type-C(USB-C) equipped iMac/MacBook/MacBook Pro | PS3/PS4/Xbox360 | DELL XPS | Google Chromebook |HP Spectre X360 | Samsung Tablet | ASUS ZENBOOK 3 | HP TPN-Q178 | HP Elite x 2 1012 | Lenovo Yoga 900 / 910 | Samsung Galaxy S8/S8+ | LG G5 G6 | Lumia 950 and many more USB C devices. Include: FireWire 400 to 800 Adapter 1pcs , elago FireWire 400 to 800 FireWire adapter provides a simple way to connect FireWire 400 devices to the latest Mac Pro, MacBook Pro, Mac Mini, iMac and all other computers with a FireWire 800 port. Just plug it in between a FireWire 800 port and a standard FireWire 400 cable's 6-pin male connector (the other end of the FW400 cable plugs into your FireWire device). HDMI Port: connect to your tv or big screen via HDMI cable. lightning connection: connect into your iPhone, iPad, iPod. Please click the "trust" and wait 10 seconds to synchronize the phone screen with the TV. 1.The lightning to HDMI adapter must be connected to power source to function. 2.3 ports need to connected well at the same time. 3.The adapter will get a little hot when using but it's normal and safe. 4. Connect HDMI to TV and this adapter, connect adapter to a power up to 5V(for iPhone)/10V or 12V (for iPad).If lower voltage,it will not work very well. 5.Due to copyright protection measures,you may not use multi-screen mirroring with some paid contents including Netflix, HULU, Prime videos, directv and other paid videos,please refer to the terms and conditions of those apps. 6. If this HDMI to ipad adapter doesn't work, pls check whether the power resource connected or reconnect the adapter, or restart your iPhone and iPad. High Quality to 1080P HD The Digital AV Adapter supports mirroring of what is displayed on your device screen - including apps, presentations, websites, slideshows and more to your HDMI-equipped TV, display, projector or other compatible display in up to 1080p HD. This cable can also support cellphone HDMI VGA. 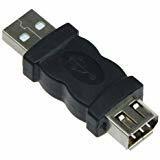 Wide Support The Adapter compatible with YouTube, IDMB, Quickflix, Family On TV, ABC, NBC, FOX, Microsoft Office and more videos downloaded and saved on your iOS. But NOT SUPPORT APPs which have HDCP video copyrights protection like Netflix, Amazon video, HBO go, HULU, SKY Q and Honda motor. Compatible Device Support YouTube, IDMB, Quickflix, Family On TV, ABC, NBC, FOX, Microsoft Office and more. But NOT SUPPORT APPs which have HDCP video copyrights protection like Netflix, Amazon video, HBO go, HULU, SKY Q and Honda motor and more. What You Get 1x HDMI Adapter, All of our products offer 30-day no-question-asked money back and 12-month product warranty. Please contact our customer service if you have any question. We are always here for you! 1.The lightning to HDMI adapter must be connected to power source to function. if not , the item will not work. Instand expansion with 6 ports, connect thumb drive, keyboard, printer, mouse, phone, hard disk. Works for Mac OS X 10.6 or higher, for Windows XP, 7 or higher, for Chrome OS.